The Ilayaraaja 75 Grand gala is all over in Chennai on Sunday evening and the memorable function is attended by many legends of Tamil Cinema including Superstar Rajinikanth, Ulaganayagan Kamal, Isaipuyal AR Rahman, and other celebrities. The event took place in YMCA Stadium, Nandhanam, Chennai to celebrate the legendary legacy of musical maestro Ilayaraaja. The function was hosted by Suhasini Maniratnam in the presence of the Maestro and other cine legends. The maverick Kamal Haasan not only made his presence in the event but also sang some of his best songs with Raja crooned by him and composed by Ilayaraja. 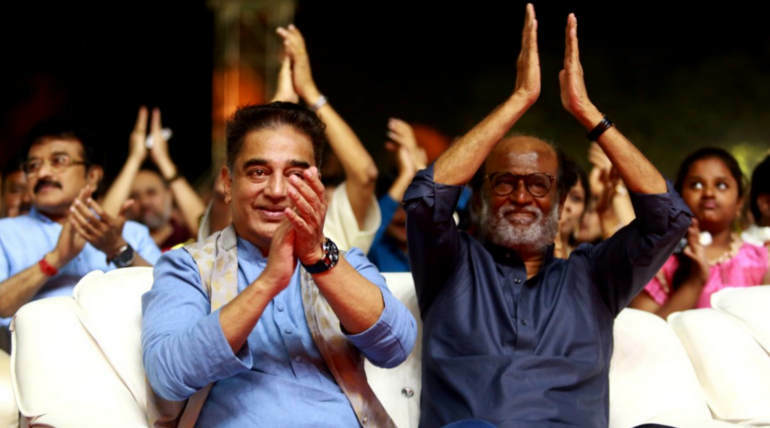 The still of Rajinikanth and Kamal Haasan sitting together and chatting with each other is viral on the internet. Also, the Oscar Hero AR Rahman performed in the presence of his musical guru Ilayaraaja and entertained the audience. Some of the exclusive stills from the event evening posted in Twitter is shared below featuring Rajinikanth, Kamal Haasan, AR Rahman and the Star of the night, Ilayaraaja. The most awaited moment - Ilaiyaraaja & A.R.Rahman on the stage together at #Ilaiyaraaja75.